Samsung Galaxy S10 leak suggests three-strong lineup | What Hi-Fi? Over the weekend, US blogger and leaker Evan Blass leaked an image of what looks to be the next Samsung Galaxy smartphone line-up. 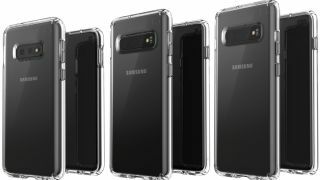 The three models, shown encased in clear covers, are apparently the S10, S10E and S10+ (from left to right, and presumably from most affordable to most premium). The leak gives us our first visual clue of the specs of the forthcoming S9 and S9+ successors. Looking at the image, we can see that the S10E evidently features two rear cameras while the S10 and S10+ have three. The S10+ looks to have dual front cameras as opposed to one, too. None of them look to be the flagship foldable 'Infinity Flex' handset Samsung is expected to release this year, although there could be a surprise announcement at Samsung's Galaxy Unpacked next month. Just don't hold your breath. With Unpacked held on the 20th February, we still have a few weeks to wait for confirmation and full details Samsung's 2019 Galaxy range. Inevitably, further leaks will no doubt be released before then.